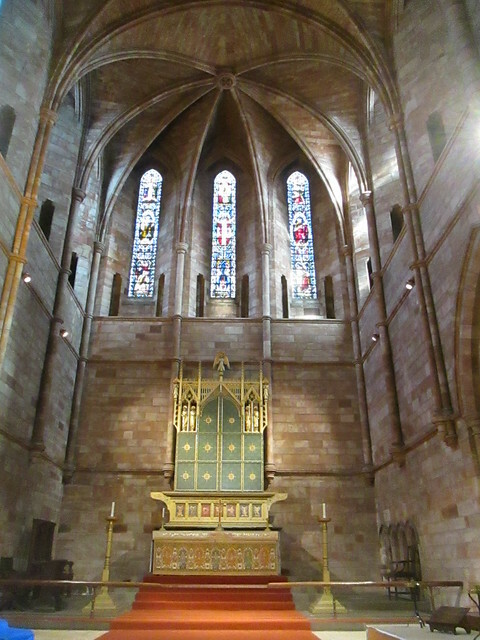 We managed to visit quite a few towns during our fairly recent trip to Oswestry, and one of them was Shrewsbury. We had no idea that the town was going to be quite as congested as it is, but thankfully we had already decided to use the very handy and cheap Park and Ride there. The traffic was incredibly heavy and slow moving, it would have been a nightmare driving through it and searching for a parking place. Otherwise we were really impressed with Shrewsbury which has a very high proportion of independent shops, so it’s quite a unique shopping experience – if you’re that way inclined. It’s not magnificent looking from the outside, but it’s better internally as you can see from the photo below. 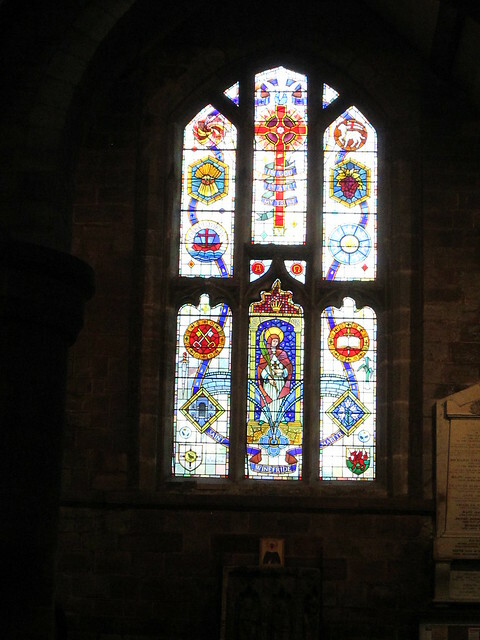 I’m sure that one of the stained glass windows is a recent one which was commissioned in memory of the author Ellis Peters/Edith Pargeter, who lived locally. She set her books around the abbey where her character Brother Cadfael was a Benedictine monk. The window below is very high up and much more ancient. 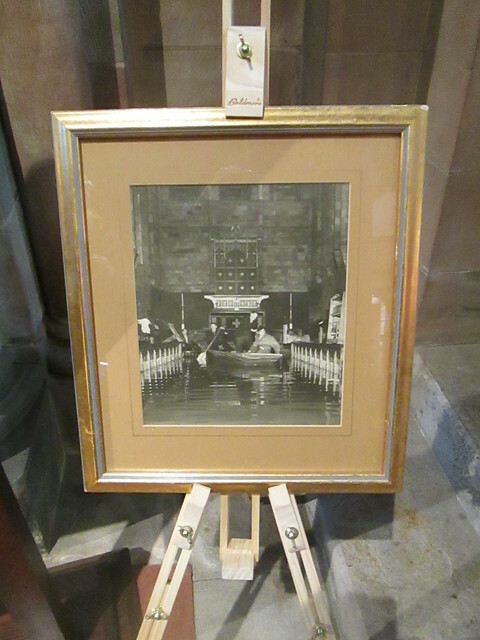 In the past the abbey has been inundated as you can see from the photo below of a boat in the aisle. The River Severn runs through the town and obviously gets too close for comfort sometimes. 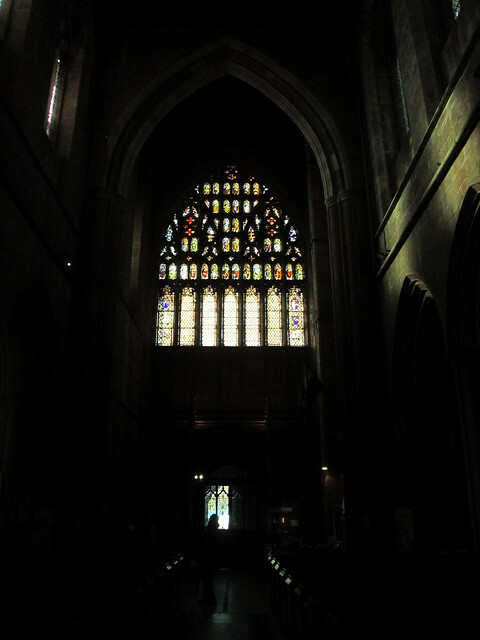 It seems to have been terribly dark when we were in the abbey, but you can see much better images here. 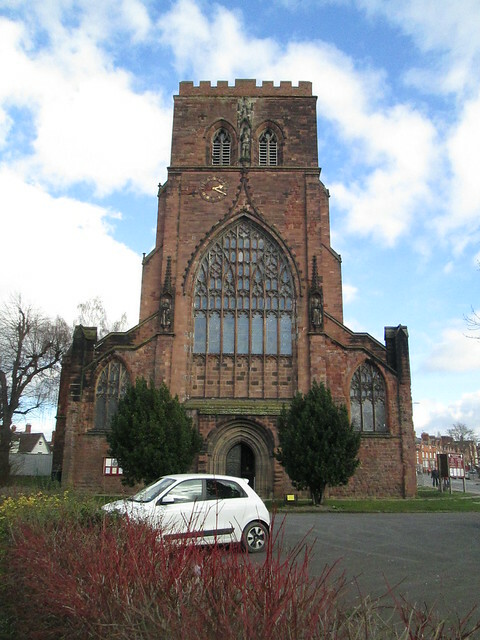 This entry was posted in Architecture, History, Towns and tagged Brother Cadfael, Edith Pargeter, Ellis Peters, Shrewsbury Abbey by Katrina. Bookmark the permalink. 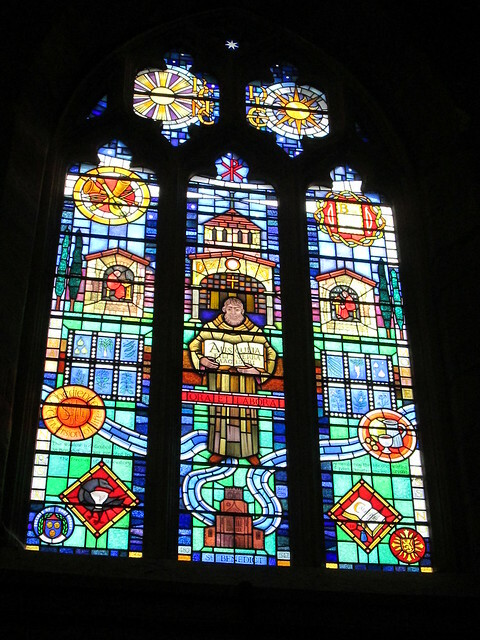 Great pictures – I love the stained glass windows. I’ve actually just read my first Cadfael book, so I enjoyed this post! I’ve yet to read any of those books although donkey’s years ago I’m sure I read some Edith Pargeter books, so long ago that I can’t remember what they were though.